Currently, the airport operates two terminals T1 and T2. The terminal T2 comprises the sectors A, b and C. the Terminals are located at a remote distance from each other, to get from terminal to terminal is free and runs round-the-clock Shuttle bus. In the terminal building T2, close to the gate, information centre. I think such an information center operates in the terminal T1. The information center is totally free you can get any information regarding the airport, the zones of departure and arrival, as well as how and where you can get to from the airport, where there are stops, etc. Barcelona airport has developed transport links to the city centre, so that, at any time of the day you can easily get from the airport to the center or from the center of Barcelona to the airport. In addition to a taxi from the airport to centre and from centre to Barcelona airport can be reached by public transport: bus, metro or commuter train. In public transport, children under 4 years free pass, does not apply to airport Shuttle buses. The terminals T1 and T2 in the center of Barcelona, walking metro line L9 Sud. Stop terminal T1 is located inside the terminal on the 0 floor. Stop terminal T2 is located outside the building. - 24 Dec to 23:00 hours. The fare is €4,60. Ticket T-10 and a normal single journey ticket on the metro to the airport is not valid, you need to buy a separate ticket. Also, for those who want to drive around Barcelona a lot of times you can use 2-, 3-, 4 - and 5-day Hola BCN card, 48, 72, 96 or 120 hours, respectively, after the first activation of the card. 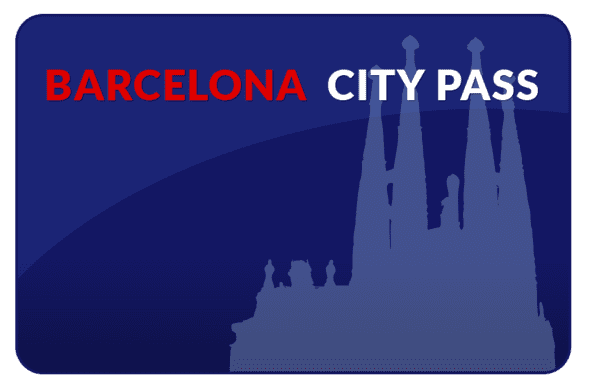 Hola BCN - transport pass, which can be used at any time of the day and unlimited trips in metro, bus (TMB) and the rest of the public transport network of Barcelona. Train - quick option to get the traffic from Barcelona airport to Barcelona city centre. Line R2 North Cercanías runs only from the airport terminal T2, passing stop: Barcelona Sants, Passeig de Gracia and Clot. The nearest stop to plaça Catalunya and La Rambla - Passeig de Gracia. The train runs every 30 minutes starting from 5:42 am to 23:38 PM. The journey time is about 30 minutes. You can purchase tickets at vending machines located at the stations. Travel by train RENFE covers the ticket T-10. Single tickets cost € 4.20. Ticket T-10 convenient to purchase if you intend to move to Barcelona to continue or you are some people. 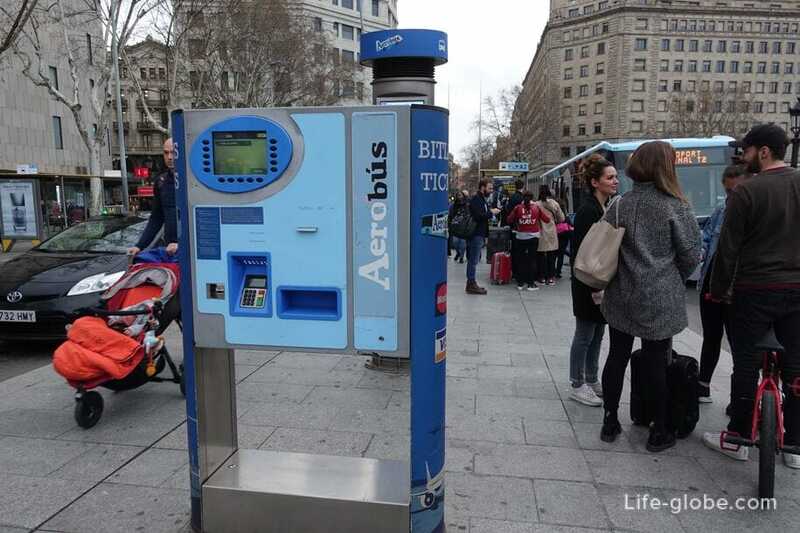 The T10 ticket is 10,20 Euros and entitles you to 10 trips on public transport in Zone-1 of Barcelona for one calendar year and expire generally at the end of February next year. In Zone-1 is located all the main attractions of the city. The time allotted for each trip is 1 hour and 15 minutes and during this time, you can make up to three connections, that is, it is possible to use up to four modes of transport (you only need to keep track of time) and it will be counted as one visit. Also the ticket at the same time can be used by several people (up to ten), passing the map to each other. Buses Aerobus: A1 and A2 - branded buses-Express trains plying from both airport terminals to plaça Catalunya and from plaça Catalunya to the airport. The bus for 35 minutes will take you to the city centre. The fare 5,90 € one way and 10,20. A ticket purchased there and back for the return journey is valid within 15 days after the first trip. Tickets are available from machines at the bus stop. You can pay by cash or card. At plaça Catalunya, near the bus staff will help you to purchase a ticket, if they themselves can not cope. You can buy tickets in advance - online. On motion, the buses from the airport stop: Pl. Espanya, Gran Via - Urgell, Pl. Universidad and Plaza Catalunya; the next Plaza Catalunya: Sepulveda-Urgell, Pl. Espanya, the airport. 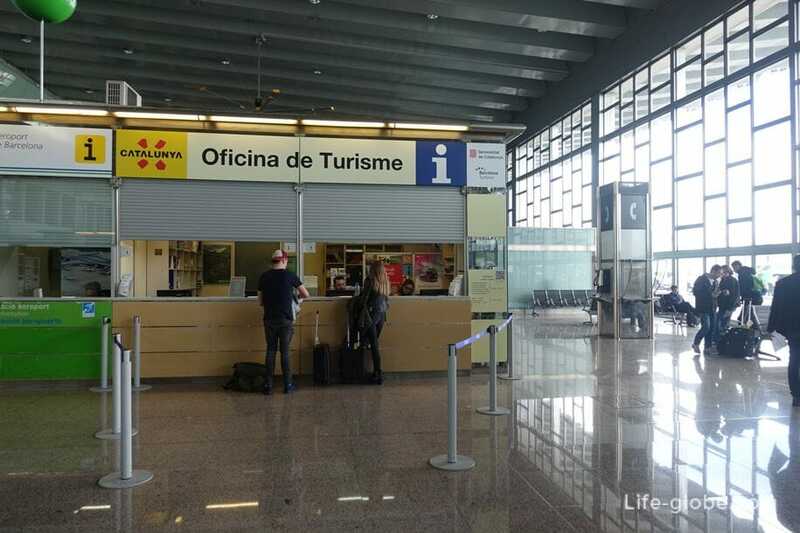 Terminal T1 - every day, every 5-10 minutes: from the airport from 05:35 to 01:05 the night; from Plaza Catalunya, from 05:00 until 00:30 in the morning. Terminal T2 – daily, every 10 minutes from the airport from 05:35 till 01:00; from Plaza Catalunya, from 05:00 until 00:30 in the morning. 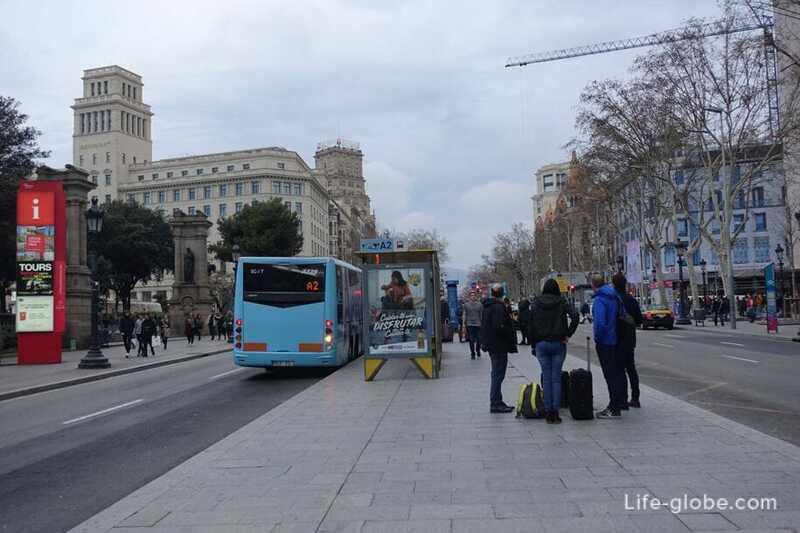 On Plaza Catalunya there is a bus stop located on the right side of the square if facing the square and back to La Rambla. Ordinary city bus. 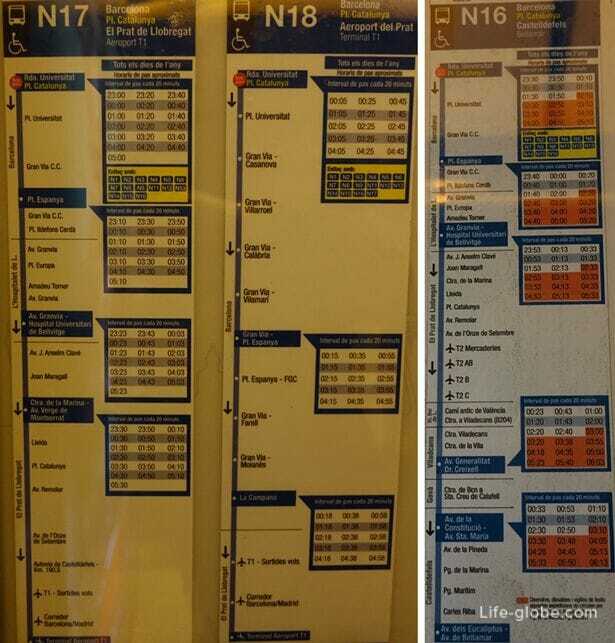 The cost per journey € 2.20, also apply card a T-10. For travel you can pay the driver when boarding but the card the driver not to buy (must be purchased in vending machines). Line of the bus 46. 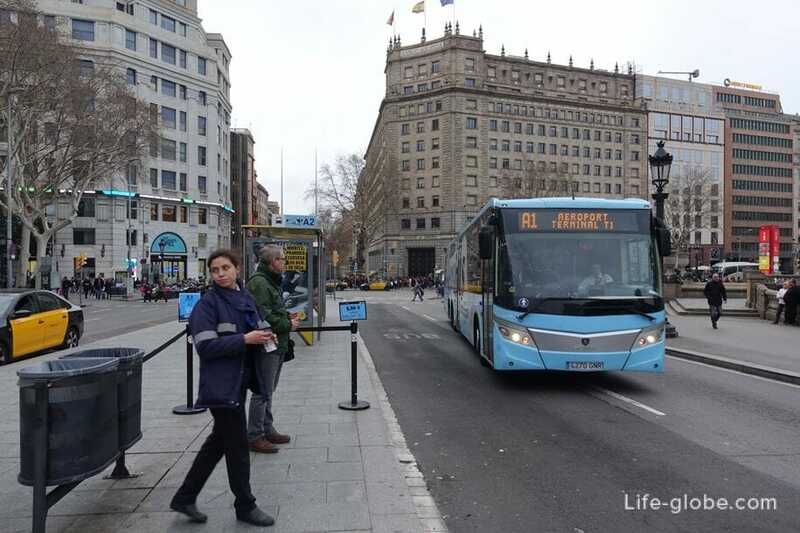 Buses run daily from Plaza españa to the airport (terminals T1 and T2) and from the airport to plaça Espanya. Time of travel: from 04:50 to 23:50 hours. Lines 16, 17 and 18. Also regular city buses, plying only at night, around 23:00 - 23:30 hours to 05:30 - 06:00 am. The fare is also equal to € 2.20, valid card T-10. The buses go to/from Plaza Catalunya. Stop near Plaza Catalunya, take the street Ronda de la Universitat. If you stand with your back to La Rambla, Plaza Catalunya remains on the right side, we reach the street Ronda de la Universitat, cross the road and immediately will stop. Stop three routes nearby. Pay to the driver at the entrance. Night line bus number 16 connects the Barcelona area of Catalonia Castelldefels and passes through Viladecans and Gavà, stopping in the terminal T2 of the airport. 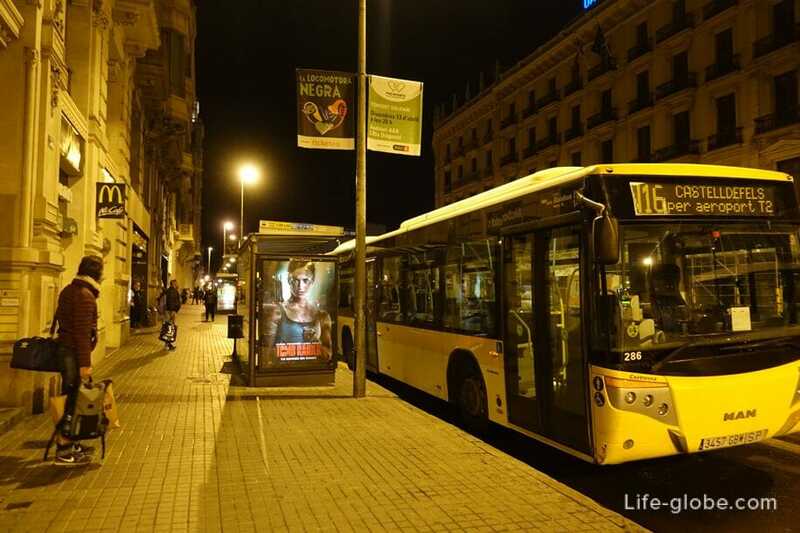 Night line bus number 17 connects the terminal T1 of the airport to plaça de Catalunya in Barcelona, passing the spot in El Prat de Llobregat and L'hospitalet de Llobregat. Night line bus No. 18 connecting terminal T1 of the airport to plaça de Catalunya in Barcelona, with a stop at the terminal T2 in the direction of Barcelona. Tickets for buses from Barcelona to other cities in Spain, France, Switzerland, Andorra and other cities and countries of Europe, it is possible to look and book here.